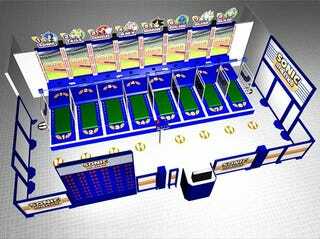 Sega&#39;s Joypolis amusement center is rolling out Sonic Athletics. Sega's Joypolis amusement center is rolling out Sonic Athletics. It's a treadmill-based arcade game that allows up to eight players to race in the 100-meter dash or the 110-meter hurdles, reports Siliconera. There's also a long jump, too, but you don't exactly jump on the treadmill. Instead, you simply press a "jump" button.